Update, July 10: Blizzard has officially confirmed the Boomsday Project expansion for Hearthstone. Like a greased cat, Hearthstone’s next expansion seemingly slipped out of the bag earlier today, and now it’s official. It’s called The Boomsday Project, and was revealed in a video on the official Hearthstone YouTube channel, which you can see below. That video was then unlisted and removed within the hour, but now it’s back live, along with a host of other details on the expansion. Either this was put live early by mistake, or Blizzard let it slip to kickstart the hype – but regardless, the developers have seen fit to now make the announcement for real with loads of interesting details. These included a release date – August 7th – as well as mention of the big new mechanic. Can’t wait until then? Scratch that itch with the best card games on PC. That new mechanic is Magnetic, which will enable you to fuse mech-type cards together for extra stats and effects. There’s also a new Warlock Hero, MECHA-JARAXXUS. 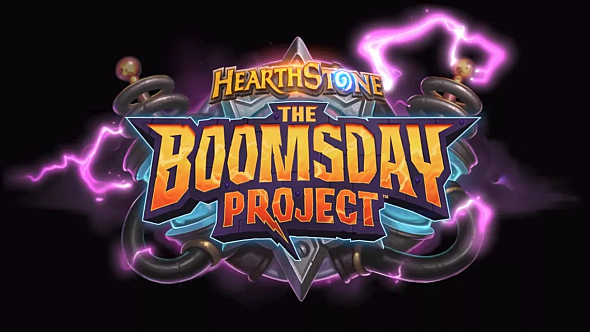 As to the setting, the Boomsday Project itself is a research facility run by Dr Boom – subject of a powerful legendary card you may remember from 2014’s Goblins vs Gnomes expansion – so we’re going back to wacky machinery and barmy experiments, et cetera. Check out the full announcement for further details on what to expect. All these features come to us in the form of 135 new cards. As usual, you’ll be able to buy into a big package of packs early, with the traditional 50-pack deal available for $49.99 alongside a bonus golden Legendary and Mecha-Jaraxxus card back. You’ll also have the choice to pony up $79.99 for an 80-pack Mega Bundle, which includes those rewards plus the new Warlock Hero himself. You can also buy both if you desparately need 130 packs at a discounted rate. There’s a reveal livestream due on July 23, where we’ll get a much closer look at the new cards. Stay tuned for details on those.